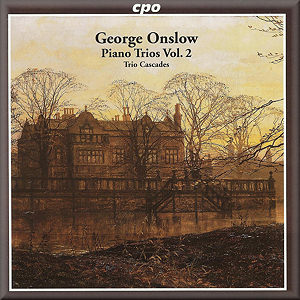 Slowly the musical world is getting to grips with George Onslow, a French composer with an English background whose achievement in the field of chamber music is quite unprecedented in French music of his time. Indeed, he was sometimes known as the ‘French Beethoven’, a little over the top perhaps, but one can see why for this is big stuff, with large aspirations, always seeking to find new expression. Onslow was never afraid of going for the big gesture, and he usually achieved it. The, very good, notes in the booklet tell us that the Trio, op.83 is probably Onslow's last work. It certainly has a maturity about it which would lead one to believe this to be true. The melodies, and Onslow could invent a soaring melody which sings on strings, are very full and long breathed, the first movement is particularly blessed with this kind of melodic invention and the working out is dramatic and very terse. You can understand the Beethoven epithet. The slow movement is very Beethovenian indeed, a richly textured adagio, of great depth and feeling. A very short, but quite demonic scherzo, dominated by hard, dry, pizzicato, is chilling and disturbing and the finale is a fast chase moto perpetuo type of movement, and breathless with it. This is a big romantic work, slightly out of time, perhaps, for its gestures are decidedly classical but what a piece – that we are only getting to hear it now is only for the better for this is fine stuff and should be heard. The second of Onslow's Trios, op.3 comes from the other end of his career and is firmly rooted in late Haydn/Mozart/early Beethoven and it has a charm about it which is delightful. Occasionally one feels Onslow trying to move in new directions, making his material more dramatic, using his deveopment sections to create tension and excitement. He is doing all he can to move out of the classical style. The melodic invention isn't as broad as in the later work, how could it be?, but it is strong and engaging. The first movement is very Beethovenian the slow movement sad and full of the most heart rending harmonies, the scherzo humorous and the finale a romp. There's a lot of Beethoven all the way through but it's still the work of an original hand and the surprise ending is a sheer delight. The performances are excellent, the players believe totally in the value of this music, and so they should, and they give marvellous performances of total commitment. The recording shows a very good balance between the three musicians and the notes are excellent. Volume 1, from these same players (CPO 777230–2) was superb (see review) and this is a worthy follow–up. Don't miss this wonderful, and very interesting, composer.